Magnolia tree roots suffer damage due to a wide array of causes including environmental issues, problems with care, infestations and infection. Familiarize yourself with necessary culture and maintenance for vigorous growth. By identifying potentially invasive conditions that may affect root health, you will know the types of symptoms to look for with corresponding control methods for healthy roots. Careful adherence to care requirements ensures healthy growth. Vigorous plants are less likely to experience illness than weakened plants. 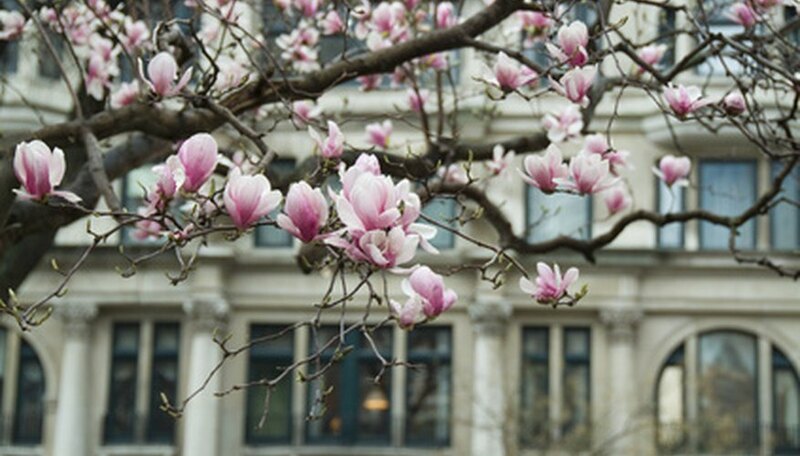 Grow magnolias in locations that provide full sun exposure to partial shade; determine which magnolia species you are growing for definitive requirements. Magnolias thrive in porous soil high in nutrient content with an acid pH of 5.0 to 6.5, according to the Clemson University Extension. Pest infestations cause damage to magnolia tree roots. The magnolia root borer (Euzophera magnolialis), for example, is a pest that feeds on magnolia root systems when in the larval stage of development, according to the University of Florida IFAS Extension. The borers generally feed on stressed roots. Look for poorly formed, shallow root systems as well as trees in declining health. Fungal infections like Phytophthora root rot often damage magnolia tree roots. This infection acts by diminishing the size of magnolia roots, deeming them only partially capable of absorbing necessary water. Most often caused by the fungus Phytophthora cinnamomi, this disease attacks magnolias, particularly in excessively wet, poorly drained soil. Look for discolored roots in a reddish hue, yellowed leaves or shoots, stunted tree growth, branch dieback or defoliation, according to the Alabama Cooperative Extension System. Magnolia tree root systems grow to a width greater than the canopy of the magnolia tree. Roots have a habit of girdling or encircling the root ball or trunk, according to the Clemson University Extension. Magnolia trees need abundant space for root growth otherwise they will become malformed and damage may inhibit optimal function, causing tree decline. Though trees are drought tolerant as well as tolerant to wet soil, they will fall ill quite easily in such cultural conditions if you do not provide ample room for roots, the nutrient absorption center of the magnolia tree. For root damage prevention and treatment, deal with pests by identifying appropriate pesticide treatments. Insecticidal drenches of the roots and crown of the magnolia tree offer effective assistance in controlling root borers. For root rot diseases, maintain extremely well-drained soil as standing water and excessive moisture provide the ideal environment for fungi germination. Apply a fungicide for root rot control; treat Phytophthora root rot with a fungicide with active ingredients Etridiozole and Thiophanate-methyl, according to the Alabama Cooperative Extension System. For cultural problems, plant magnolias in large landscapes far away enough from houses and structures for root growth; for potted plants, utilize spacious containers. Cut girdling roots, particularly those forming circles near the soil line, according to the Clemson University Extension. Tarah Damask's writing career began in 2003 and includes experience as a fashion writer/editor for Neiman Marcus, short fiction publications in "North Texas Review," a self-published novel, band biographies, charter school curriculum and articles for various websites. Damask holds a Master of Arts in English and creative writing from the University of North Texas.